IT was Thursday afternoon. The 63rd Republic day parade was over by then. 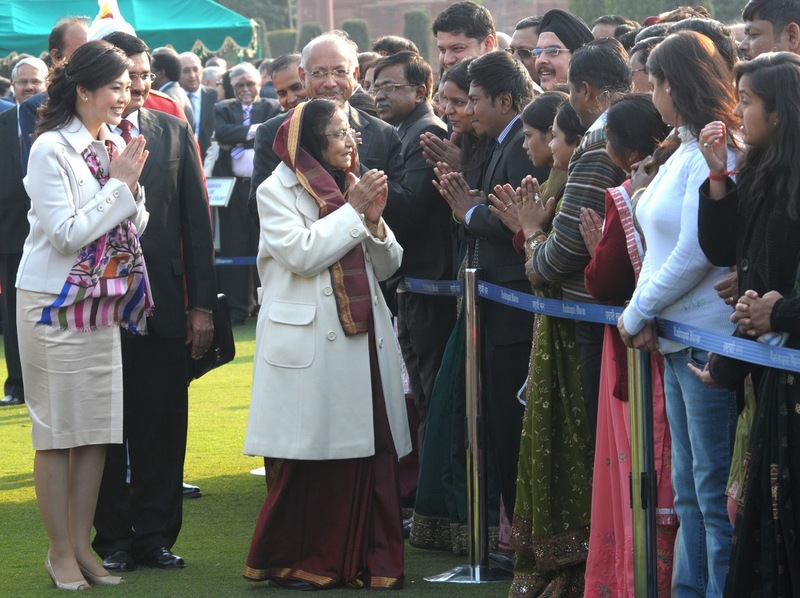 Country’s top bureaucrats, diplomats, armed forces officials along with their spouses reached the backyard of Rashtrapati Bhavan to join the high tea party hosted by President Pratibha Patil. The menu of the President’s “At Home” party included samocha, pakora, fish fries and sweets. And of course tea and coffee! President Patil who is completing her five-year term in July this year seated at the VVIP enclosure along with Thai Prime Minister Yingluck Shinawatra, Congress President Sonia Gandhi, Vice President Hamid Ansari, Prime Minister Manmohan Singh, Lok Sabha Speaker Meira Kumar and Chief Justice of India SH Kapadia among others. But the bureaucrats and diplomats enjoyed the moment by roaming around the sprawling and elegantly manicured Mughal Garden at Rashtrapati Bhavan. It was a sunny afternoon, and none of the 1000 guests was in a hurry to go back home. Chief Vigilance Commissioner Pradeep Kumar and his wife were greeted by many officials present there. Ex-US ambassador Meera Shankar and her husband Ajay Shankar, a former industry secretary, were also spotted chatting with their friends in the corridors. Montek Singh Ahluwalia's adviser Gajendra Haldea, ex-CBDT chairman PK Mishra and minority affairs secretary Surajit Mitra were among those seen chatting with friends and colleagues. A number of secretaries, former governors and political leaders were also present during the occasion. None of the officials and armed forces bigwigs probably had any idea that 44-year-old Thai Prime Minister Yingluck Shinawatra was by then one of the top 10 Twitter trends in India. But Shinawatra wearing a cream skirt and jacket was the cynosure of all eyes during the high tea party. Those who were present near the VVIP enclosure said woh! when Thai PM said: Namaste India. Very good insight. babu blogger should give more such interesting and exclusive happenings in corridors.